Getting ready at a small bed & breakfast or inn can have significant advantages over a major chain hotel, as this lovely image shows. The Mango Inn Bed & Breakfast in Lake Worth, Florida, has a casually sophisticated feel without the stuffiness that can often be the vibe from a place that's too fancy. Having the ability to book the entire bed & breakfast for the wedding weekend not only keeps the closest family members nearby, it also provides a modicum of luxurious privacy by feeling like you have the entire place at your disposal (which in fact you do). Supporting small businesses such as boutique hotels, cafes, and yes, photographers, keeps the local economy humming along while making your wedding truly unique. Focusing on the sparkling drips of water overflowing the top tier of this courtyard fountain draws the viewer's attention to the sunlight streaming through the hedges, with detail so realistic it feels like you can reach out and splash around. 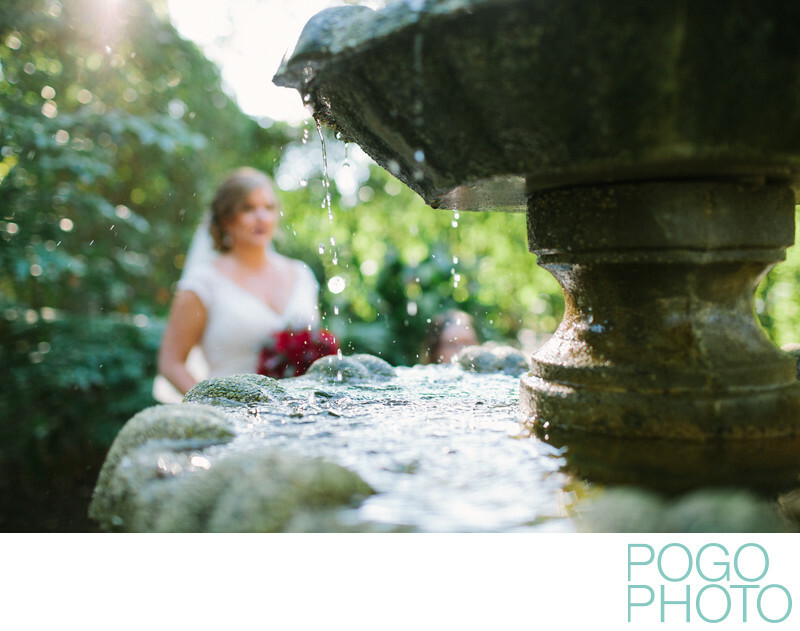 Having the bride in the background of the fountain ties this in as part of the wedding day, with her quintessential red bouquet, flattering deep v cap sleeved lace wedding gown, and elbow length veil. Telling the story of the day involves showcasing many details as they are presented to us, which helps paint a picture of what it felt like to stand in that courtyard on that warm winter day. Location: 128 North Lakeside Drive, Lake Worth, Florida 33460. 1/400; f/2.0; ISO 400; 35.0 mm.